While, being the uneducated type, I can only begin to half-understand the science behind ‘nitriding’, at the time of writing, the group of HandPan that are often referred to as being ‘the big four’ (Hang, Halo, BElls, and SPB), are all nitrided. Meaning; that while there have been some very nice sounding non-nitrided HandPan released into the wild, the process of nitriding the shells, it would seem, is a crucial step in the construction of producing a ‘top-tier’ HandPan. So, essentially, as I understand it, nitriding the steel makes for a more stable instrument, both physically, and in terms of strength of tone. Non-nitrided HandPan have been known to go out of tune fairly easily (in cases), while nitrided HandPan, being harder, are believed to better hold their tuning. 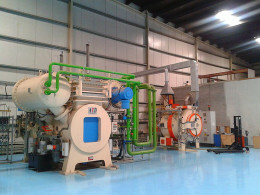 And while there are various different methods of nitriding, as far as is known, ‘gas nitriding’ appears to be the process of choice, for the makers of the ‘big four’. And it is one of (if not the only step) in the construction of a HandPan, that is usually outsourced to a third-party.